Here at J.M. Smith Landscaping, we strive on the satisfaction of you, the Customer. We will do whatever it takes to create what you deserve. Whether it is a small front entrance, or a large backyard oasis, you will always get the same care and work ethic from our knowledgeable, energetic crew. We provide functional and fresh new ideas to help you get the most out of your desired landscaping project(s). We specialize in Landscape Construction which includes interlock walkways, interlock patios, interlock driveways, armour stone, natural stone, and much more! At J.M. 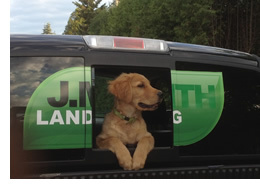 Smith Landscaping, we like to make the experience for you, the homeowner, a positive one. We develop strong customer relationships by taking the time to getting to know you and your needs. We believe it should be more of a personal experience than a business experience. We encourage our customers to ask questions, and want them to feel comfortable during the construction process. Please contact J.M. Smith Landscaping and turn your dreams into reality! I am a certified Landscape Contractor, successfully completing the “Horticultural Technician” Apprenticeship at Humber College, and passing the Ontario Government issued exam. Landscaping is more than a job for me, it is a passion. I wake up every morning and I am excited to go to work. I am excited to start a new project, to finish a project, to meet new people. That passion is what I bring to each customer meeting and to every job. When you work with me you will know that I put 110% of everything I have to give you the landscape that you deserve. Satisfaction of the customer, as well as myself, is what drives me. I could not picture myself doing anything else besides landscaping.